Peyote is a powerful psychedelic. Its active ingredient is mescaline. 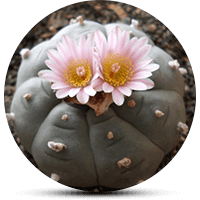 Although peyote is not physically addicting, it can lead to psychological dependence, madness, and death. Not surprisingly, it’s Schedule I drug. Peyote addiction signs are a distortion of thinking, troubles sleeping, obsession with spirituality and legal problems. In the case of peyote addiction, seek treatment immediately for you or your loved ones. Cactus are unusual plants, they resist extreme conditions. Yet still, they bring beauty into our homes with their shapes and flowers. However, cacti are favorite of some people not because of their floral value but because of their ingredients. In particular, the peyote cactus and the active hallucinogen mescaline in it. 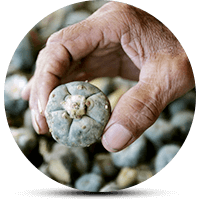 You can find Peyote in the northwestern parts of Mexico. Also, you can find it in the southwestern areas of the U.S., which we know as the great Sonoran Desert. So if you want to enjoy a trip to the hidden dunes of your soul under the weird guidance of mescaline. Have in mind that you can get lost in the sands of your mental state and get trapped by peyote addiction. But if someone uses peyote its spiritual properties, why is it Schedule I drug? Although peyote can’t cause physical addiction, the drug is habit-forming. Thus, it can lead to tolerance and psychological dependence. Which, sadly can result in broken families and fatal accidents. Also, one can show an abnormal interest in spirituality, God, and self-perception. It’s important to recognize peyote addiction as soon as possible because mescaline can be dangerous. The long-term abuse can lead to fatal mental problems. As mentioned above, peyote is not physically addictive. Although, it can cause psychological addiction and severe mental problems. Temporary psychosis is a common condition caused by peyote addiction. Thus, can results in paranoia, visuals, and distorted thinking. It can become a permanent mental issue. Hallucinogen Persisting Perception Disorder is another condition characterized by sudden hallucinations. This can be stressful for the user, especially when there are no patterns of recurrence. Flashbacks can lead to madness and fatal accidents. Imagine seeing stuff and hearing colors while driving – a year after your last peyote trip! Bad trips are another risk. The type of trip depends mainly on the product, the environment, and the user’s well-being. Nobody is immune, though. Bad trips can cause stress, depression, fear, and death. All these dangers can lead to risky behavior and can be hazardous to the people around the user. That’s why recognizing peyote addiction is crucial. Simply because it can save lives. Peyote Addiction Signs: How to tell if your loved one has an addiction to peyote and needs help? If you think that your loved one has an addiction to peyote, then you should help them find treatment. If while reading you’ve realized that you might be the addicted one. You should do the same: ask for help straight away. Peyote Addiction Signs & Treatment: What’s Next? First of all, be supportive and open. We should understand that it’s hard for the users to admit that they have an addiction. Especially to a substance that is not physically addicting. What’s more, due to regular use, the addict might have troubles thinking and recognizing reality. That’s why you should be understanding. If you are the one who needs help, does the same: is open and remembers that there’s nothing to be ashamed of. What’s more, have in mind that there’s no antidote to the peyote trip. So good or bad, you should experience all its effects. The effects of mescaline can last up to 12 hours. Make sure that there are loving people and a safe environment while you are waiting for the effects to wear off. Finally, note that the treatment of peyote addiction should focus on the psychological aspects of addiction: triggers of addiction, self-perception, and perspectives. Holistic approaches and yoga can be very helpful. Especially for people who have an interest in alternative practices. Many rehabilitation facilities offer suitable programs for peyote addiction. That’s not surprising when we take into consideration the number of people that abuse hallucinogens. Statistics show that only in 2014 136,000 people between 12 and 17, 502,000 people between 18 and 25, and 535,000 over 26 admitted using hallucinogens. You could only find Peyote in the wild. Well, until now, it can be synthetically made, which leads to more and more users. Do not forget that there’s no such thing as a peyote withdrawal, so getting clean is something you shouldn’t fear. Treatment is available, and you are strong enough to fight your addiction. Choose the magical reality of sobriety!